A Wonderful MInistry Opportunity–Don’t Miss It! Please consider getting involved in this excellent ministry. I can personally vouch for the leader, a humble and godly woman named Marilyn Orton. These children need our help. Let’s not let them down! La Casita, a shelter in San Pedro Sula, Honduras, is a refuge for 75 pre-teen and teenage girls unjustly tainted by drug leaders. As children, their innocence is stolen as they are used to transport drugs. Many have a baby. Children having children. Although the shelter is safe, the living conditions are deplorable. 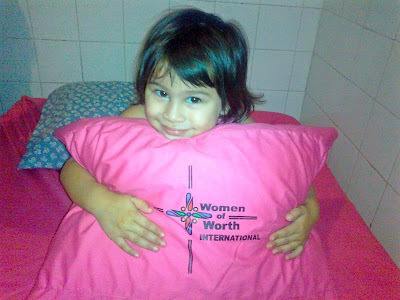 Most slept on boards with no mattress until Women of Worth International became involved. Now each girl has a new mattress, bedding and pillows. Slowly La Casita is being transformed into a real home, with newly painted walls, movie nights, and a new fence being built around the complex to keep the drug dealers from snatching the girls. Many of the girls have received Christ.